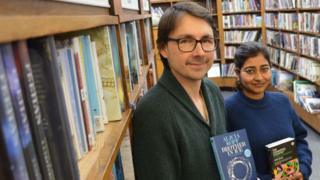 When author Kamila Shamsie challenged the book industry to publish only women in 2018 to help address a gender imbalance in literature, just one publisher took up the challenge - the Sheffield-based company And Other Stories. It was almost three years ago that Shamsie suggested "a concerted campaign to redress the inequality" in publishing. Arguing that there was a gender bias in book awards, reviews, top publishing jobs and prestige afforded to authors, she suggested that 2018, the centenary of women over 30 in Britain getting the vote, would make a good Year of Publishing Women. Women would be prominent in review pages and blogs, shop windows, festival line-ups and prize shortlists, she predicted. The response? A lively debate about opportunity in literature ensued, but only one person responded to the call to arms. That was Stefan Tobler, founder of And Other Stories, which publishes a mixture of translated and English language authors. The company made its name with Deborah Levy's 2012 Booker Prize-shortlisted Swimming Home. "We did look at what Kamila was saying and did think she was right, that the importance given to male writers was still more," Tobler says. "They don't necessarily sell more books, they don't necessarily have more fans, but as far as prestige goes, there is still a difference there." The gender imbalance is even more pronounced in translated fiction, where Tobler says 30% of books are by women because fewer women are given support in some countries where those books are sourced. And Other Stories publishes about 12 books per year from an office in Sheffield Central Library - they relocated there from London in 2017. Tobler says the Year of Publishing Women means they can get behind female authors they might not otherwise have had room for in their schedule. "We're not publishing anything that we're not really, really excited by and it will start us off with some authors that we'll carry on publishing for many years," he says. The year's first two books - a collection of rare and unpublished writing by cult 1960s author Ann Quin and a translation of Swiss author Fleur Jaeggy - are already out. Others by Catalan author Alicia Kopf, American Christine Schutt, Mexico's Cristina Rivera Garza and late Argentine author Norah Lange will follow. Enthusiasm for the Year of Publishing Women in the rest of the publishing industry was, it's fair to say, mixed. Some lauded Shamsie's motivation but were less keen on the practical implications and the idea of excluding male authors entirely. Some had a problem with the message sent by giving women special treatment. Author Lionel Shriver called the idea "rubbish" because the suggestion that women needed special help was "problematic and obviously backfires". Others said there wasn't a problem, and the success of female authors should be trumpeted instead. What do the stats tell us about whether there is a gender imbalance? Among the UK's major literary awards, 57% of Booker Prize nominees in the last 10 years were men, but 61% of Costa Book Award winners in that time were female. It's not just about the gender of the author, but also the gender of the characters - in 2015, author Nicola Griffith found 12 of the previous 15 Booker Prize-winning novels had male protagonists. In its annual audit of book reviews, lobbying group Vida found most literary publications still give much more space to reviewing books by men. In 2016, just 26% of reviews in the London Review of Books were about titles by women, with a figure of 29% in the Times Literary Supplement. In sales, though, the situation is reversed, and then some. Nine out of the top 10 best-selling literary authors were women in 2017, led by Margaret Atwood, Sarah Perry and Helen Dunmore. Haruki Murakami was the sole man on the list. Hannah Westland, publisher at Serpent's Tail, believes the Vida stats are skewed because they include non-fiction - where there is "absolutely an imbalance". And the Booker Prize has seen more male winners in recent years because American authors were admitted four years ago, and American men are more likely to be submitted than women, she believes. "In my experience, publishing is an industry where some of the most inspiring people at the top are women," Westland says. "Actually, of the books I've published, the ones by women have been far more successful than those by men, and you can see that replicated across the board. "While there are so many important arguments and conversations going on within feminism and about gender imbalances in all walks of life, publishing is a place that is a real success story. "I was very frustrated by the idea that young women, or young female writers, could be given the impression that they are in any way going to be underserved by the industry because in my view it's entirely the opposite and we should be celebrating our strength and success." Stefan Tobler of And Other Stories says he can see why the Year of Publishing Women may not have received wider support. "The danger I guess by doing something like this is it looks like women are victims and downtrodden, when the fact there's an inequality there doesn't necessarily mean that women authors will want to be seen in those terms," he says. "So I can see why there was resistance. But from the facts and figures we saw, we did think there was an inequality, so I wanted to do something."